Two friends gave me a brief for a post: stripes, black and white stripes. Apparently huge last summer. Where was I? Staring at the sidewalk, it seems. Just as there is a red for every woman, there's a stripe. In the right scale for your figure, it lends a reprieve from solids, and is more versatile than a print. Stripes are jaunty (a word hardly anyone ever uses anymore) and read preppy, arty or just "having a great day". Below, five striped knits that cross the the ruled lines. Not one is black and white, but each has its own distinction. J. 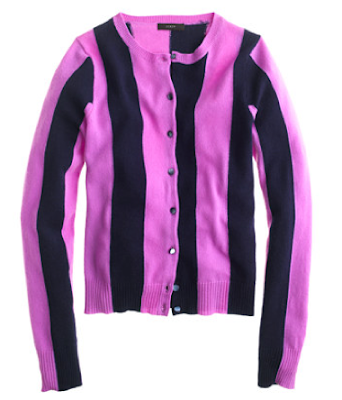 Crew's wide stripe cashmere cardi has vertical stripes that lengthen the torso. I'd lean into the tart fuchsia and navy combo; price, $310. Unlike a friend's Jack Russell, degradé stripes are not up your chest the moment you walk through a door. 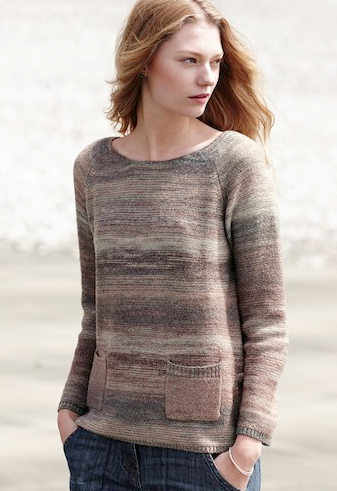 Poetry UK's raglan stripe sweater only suggests bars. Made of wool, bamboo and cotton, it is also offered in other subtle colourways. Price, £99. Pricey but perfect. So, I covet this MaxMara stiped cache-coeur of navy, grey and beige in a silk-cashnere blend. It has irresistible wearability but it's not bread and butter safe. 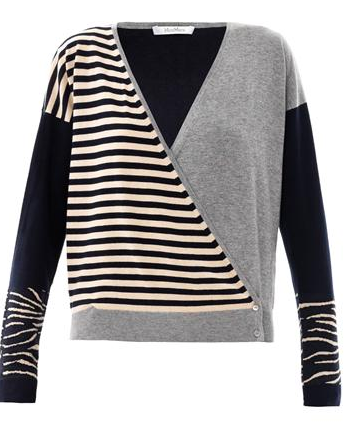 The striped panel says "fearless" and the sleeves murmur "chic". OK, it's £246 (about $380) at Matchesfashion.com but, as they say, that's the price of poker. As far from a bold stripe as an orchid from a dandelion: Eric Bompard's autumn white with gold, a discreet dream in 2-ply cashmere. At €260—and then eternal drycleaning (thanks to the sparkly bits)—you're making a commitment, but also a statement. Also in black with silver stripes. A placed stripe avoids the visual widening effect, but adds snap. Look for a knockout colour combo like Gitane blue/cream/black, as in a cashmere and wool sweater by Marina Rinaldi: a whole new life for stripes, and made for sizes 10-24. A scarf ties together an outfit without being too matchy. Watch out, these two may be borrowed by a mister! Brora's fine-striped grey cashmere-and-silk scarf is my cup of English tea: steel blue and oxblood spark the grey. Price, £115. Prefer brights? 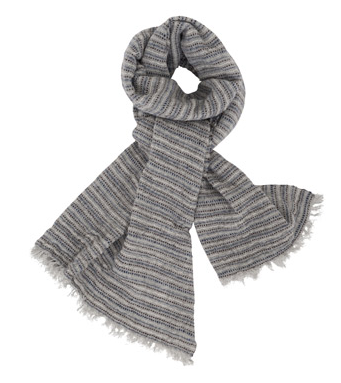 Eric Bompard's multicolour striped scarf, 4-ply cashmere, €154. "Who's wearing that scarf today?" Completely different in mood; I just could not make up my mind, so showed you both. The sweaters are beautiful but at those prices kind of a stripe commitment. I'd be completely happy with the Brora scarf. Stripes are almost a creed in San Francisco. I confess I prefer the classics, a pinstripe, the marinière, etc. I'm wearing stripes today, in fact, a striped dress, black and grey. . . . I love the colours and the obvious comfort of that Bompard scarf, mmmmmmmm! I love the scarves, both of them! I also like the Max Mara, but my nine-year-old son looked at it over my shoulder and said, "Oo, that's scary!" The male reaction?? The grey scarf speaks my language.. I wear a white and navy striped Breton Tee by Banana Republic and I feel energized when I wear it! Stripes can really be a clever disguise for figures. I really like the Rinaldi sweater and the grey scarf. But lately I am not really drawn to stripes...except maybe the tiny pinstripes.